From Speculations about Exoplanets . . . Obtaining images of exoplanets would represent the solution of perhaps one of the longest standing problems in modern astronomy and open the door to the identification of biological activity in the universe as a whole, not just within our own solar system. The notion that life exists elsewhere in the universe is not new. Indeed, in 1755, Immanuel Kant devoted an entire section of his Allgemeine Naturgeschichte und Theorie des Himmels to what such planets might be like and who would inhabit them, based on Newtonian physics. After Kant, many generations of scientists, novelists and the interested public also speculated. The idea of exoplanets is older than empiricism, but the scientific evidence for them is new, and the detailed study of their physics, chemistry, geology and biology has hardly begun.
. . . To Indirect Evidence . . .
1992 A. Wolszczan and D. Frail used the Arecibo radio telescope to conduct extremely precise measurements of pulsars. The precision of these measurements is staggering: they measured the period between pulses to one part in about 1015. They noticed that one pulsar exhibited a regular change in its period. Pulsars, for reference, have periods that are so regular that changes can take years to measure, even with this astonishing precision. The only viable explanation for this measurement was that two small bodies must be orbiting the pulsar itself, causing a reflex motion in the star. The reflex motion was due to the mutual gravitational attraction of the pulsar and the two small bodies, manifesting itself in changes in the period between pulses as they arrived at Earth. The pulses were separated by slightly larger times as the pulsar accelerated away from Earth and smaller times as the pulsar accelerated toward the Earth. These accelerations happened at regular intervals, allowing Wolszczan and Frail to derive the orbits and masses of the planets. Since 1994, when Wolszczan confirmed and refined the measurement, no one has disputed the notion that planets exist around pulsars. However, the discovery did not galvanize public attention the way the discoveries of exoplanets in the mid-1990s would. This is because it is very difficult to conceive of life existing on the pulsar planets. Pulsars are extremely dense end states of relatively high mass stars. They form out of the supernova explosion of these stars and exude tremendous amounts of biologically harmful radiation. These pulsar planets are definitely interesting from an astrophysical point of view, but there is no obvious connection between them and the search for life, other than the fact that they may be the remnants of planets that were habitable before their sun blew itself up, and even this is uncertain at best. In 1995, the field of exoplanets woke up: M. Mayor and D. Queloz announced the indirect discovery of a body, roughly the mass of Jupiter orbiting a bright, sun-like star, 51 Pegasi. 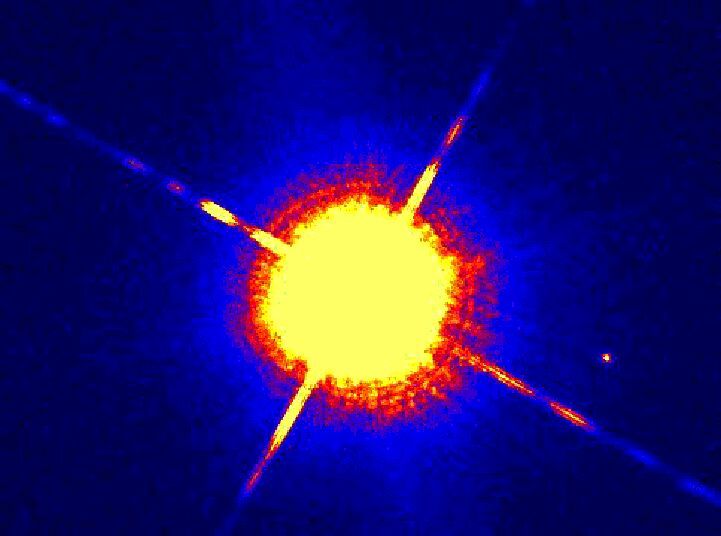 The following week saw the publication of the first images and the Jupiter-like spectrum of a substellar or brown dwarf companion of a different nearby star (Nakajima et al. 1995; Oppenheimer et al. 1995). Finally, objects less massive than stars had been found outside the solar system. Although the brown dwarf, Gliese 229B, shown in the picture at the top of this page, bore great resemblance to Jupiter, it was clear immediately that this was no planet. It fit the theoretical notion of a brown dwarf and probably has a mass about 20 times larger than that of Jupiter. The brown dwarf discovery provided a glimpse of the future exoplanet observations, in which the spectrum of a planet orbiting a nearby star would provide direct measurements of the planet's atmospheric composition, its physical structure, and its surface. However, the technique that provided the images and spectrum of Gliese 229B not not developed enough to provide the extreme contrast needed to see Jupiter-sized or smaller planets. For now, the study of exoplanets had to remain an indirect one, although brown dwarf science was clearly feasible. Several other techniques for indirect detection of exoplanets have been used, including microlensing, microarcsecond astrometry and transit observations, which we will not describe in detail here. Although these indirect techniques have determined the existence and some physical characteristics of high-mass, short period exoplanets, they suffer a major limitation: they obtain neither images nor spectra of the planets themselves. Without spectra we can know very little about what these planets are like and whether they may host life. To get spectra we must first directly detect and locate the exoplanets. Gathering images and spectra of exoplanets means that one can compare those planets to each other and to those in our solar system. Quantitative comparisons permit deep physical understanding, in this case of the planet formation process, of the physics of planet interiors, of the diversity of planets in the Galaxy. For example, have you ever considered what a planet five times more massive than the Earth might be like? Perhaps astronomers will find just such an object in the near future. This heralds a new subfield of astrophysics, one which we call comparative exoplanetary science. The Lyot Project is one small part of this new field, one which addresses some of the technical issues preventing exoplanet imaging today. As we attack the technical problems we hope to glean interesting scientific results.